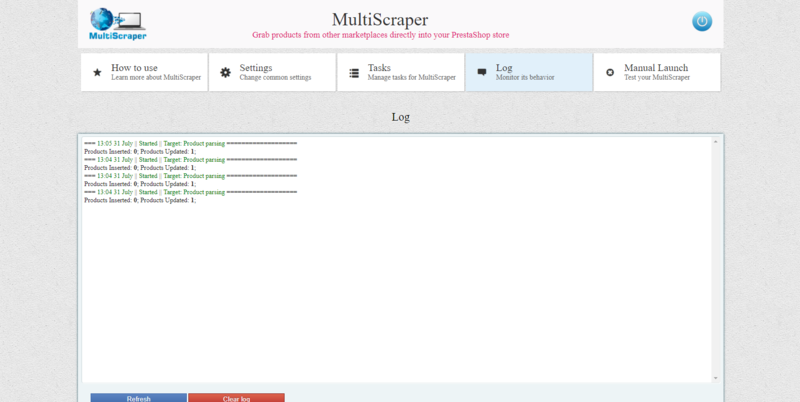 MultiScraper is the software for automatic bulk product upload from any big market directly into your PrestaShop store. 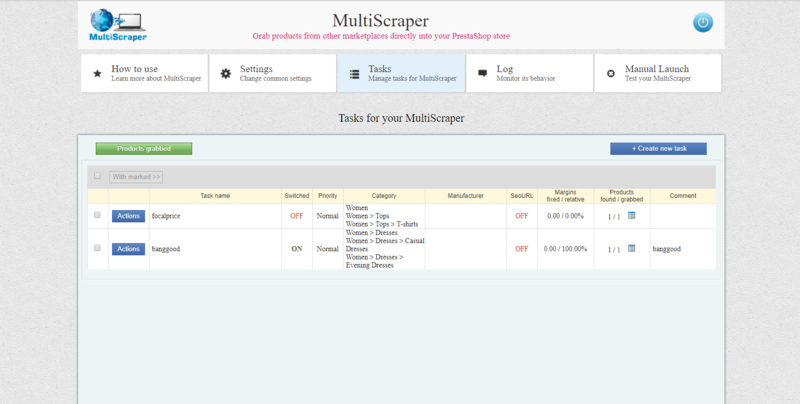 MultiScraper will grab all products you need step by step (product by product) and insert them into your PrestaShop store. Unlimited categories and products grabber (you may define several Listings or product’s lists in one task. Also you may define several categories of your store where the grabbed products will be inserted). Ability to switch ON/OFF any task (like you press “Pause” when watching the movie). Ability to define separate folder for product’s images grabbed by each particular task. Auto updating all grabbed products (after the MultiScraper grabbed and inserted the products in your store, it will periodically update these products – will check if the price or stock status or attributes of some product were changed). 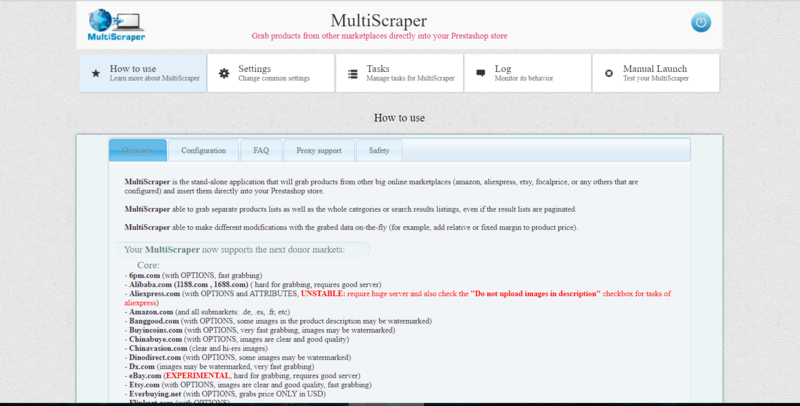 Ability to choose the action that MultiScraper will do if the grabbed product no more available at the donor market or is out of stock (you may choose “Delete the product”, “Set up 0 quantity to this product”, “Set up out-of-stock status to this product” or “Do nothing” or some other option). Ability to set both fixed and/or relative price’s margins of all products grabbed by each particular task ( for example, add 10% and $20 more to original price ). Ability to set donor market’s currency (Note, that MultiScraper just grabs digits and if your own store’s currency is different than donor market’s currency, MultiScraper will translate the price value into your store’s currency using the currency exchange rates in your store’s settings). Data capacity: up to 10000 products grabbed/daily ( depending on your server’s abilities ). NOTE: “up to” does not mean that we gurantee 10000 products grabbed from ANY donor market and on ANY server. Some markets are extremely hard for grabbing (examples are taobao.com, alibaba.com, aliexpress.com etc) so it will be good if you will be able to grab at least 1000 products daily from them. Another ones are vice versa: very friendly to the bots that are collecting data from other websites – MultiScraper will grab thousands of products from them without any problems. PROXY server’s support ( Ability to define your own proxy servers list and MultiScraper will grab products through these servers – may be very usefull if the donor market blocked your domain while intensive grabbing or you just want to hide your Domain/IP from the donor markets). Built-in interface for monitoring the MultiScraper’s processing (Log’s section). Free Trial release: [TRIAL version] Note, that Free Trial version able to grab Focalprice.com donor market only and is limited to 30 products grabbed. Capacity. This software is html web scraper, the web scraping is not the easy process. You have to have quite strong server to be able to grab products from another marketplaces in big range. MultiScraper may not process properly at Free Web Hosting areas, cheap hosting plans (or may be used at cheap servers to grab low numbers of products from simple markets like focalprice), servers with strongly limited resources, etc. 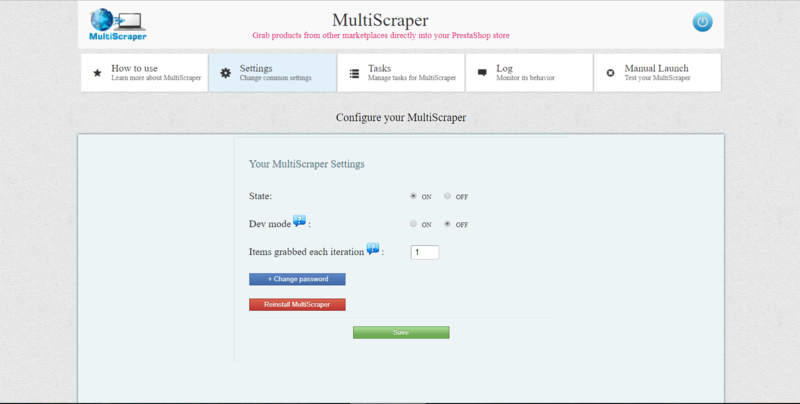 Be sure that your server abilities allow to use MultiScraper before purchasing it. Please, DO NOT purchase this software if you have weak server with unstable internet connection! About Image Watermarks. If the image at donor market is watermarked, it will be grabbed into your PrestaShop store watermarked too. The Exceptions are Focalprice.com, Pandawill.com Wsdeal.com, Amazon.com, and some others. Unfortunately there is no way to remove watermarks automatically in php, but some markets give the ability to download non-watermarked images in special resolution. About Guarantee. Some donor markets are extremely hard for grabbing, so parsers for them supplied WITHOUT ANY GUARANTEE. Please, learn the donor markets list at the official website carefully because we will not accept the complaints for these marketplaces, just suggestions. About Stability. For some reasons MultiScraper may stop grabbing content from certain websites. If the problem remains after you will upgrade this application – let me know on the support email (see below). In most cases we will find the solution how to resolve it but sometimes not. Content scraping is unstable process a-priory. For example, donor market may forbids too many connections from your domain. PrestaShop store installed. Tested at PrestaShop 1.6.x, 1.7.x versions (other versions may be tested by request). 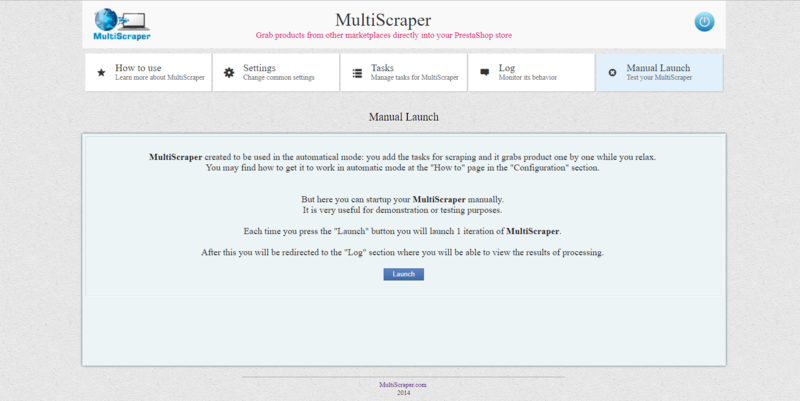 After the MultiScraper is installed, visit the “How to use” page (last item in the top main menu of the MultiScraper’s interface) to learn how to configure and start using it, and also get the answers at the FAQs section. Feel free to contact phenomena44@gmail.com for support, complaints and suggestions.